Books, Bargains, Blessings: You can rent textbooks? When I went to school, it was back in the Dark Ages. One friend -- and only one friend -- had a laptop. Not only that, there was a way he could call in to some place and find out different information. I thought he was a show off when he lugged his laptop to class to take notes. In the computer lab, we had big computers that took 5 1/4" floppy disks, and connected not to the Internet, but to a printer. So when I was in undergrad, the only way we could save on textbooks was to put the word out about what classes we were taking and hope someone had a book they would sell you cheaply. The only place we could buy our texts was the campus bookstore, and of course with a monopoly on them, they raised prices astronomically. I remember the fury of a friend when she went to sell back a textbook she paid $75 for, and they told her they would pay her $4 for it. It was going to be used the next semester, and of course, they planned on selling it for $75 to the next student. Times have changed. First there was the Internet and you could go online to find textbooks you could buy. Now, you can even rent textbooks! 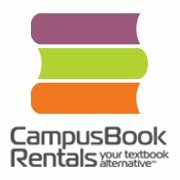 Campus Book Rentals is a place you can go to type in what books you need for your classes. It doesn't matter if your school runs on a quarter, semester, or if you are doing the dreaded summer school, you can rent for the time frame you need, and pay accordingly. Before I was in the hospital in February, I was accepted for a distance learning program, so I decided to check out what I could have saved on the books I needed. The list price of A Survey of the Old Testament is $50, but if you click this link, you can see I could have rented it for a semester for $23.68. That is a 43% savings! I checked another book they offer. I remember when I was in school my Abnormal Psychology textbook was expensive. The list price on this book is now $135, but they rent it for $26.81 for the semester. Think of all the pizza you could buy saving over $100 on one textbook! But, because I was doing distance learning, I had six months to complete the course. Because of their flexible dates, I could have rented that book for $29.02! Not only that, they offer free shipping both ways on rentals, so you don't have to worry about how much extra it might cost in shipping! If you decide to keep your book once you're finished with it, you pay the difference between the book's value and what you have already paid. If you happen to drop a class, there is a 30 day guarantee and you can receive your money back! I know when I was in school I always loved highlighting in my books, and when I bought a book, I prefered a highlighted one. Well, with Campus Book Rentals highlighting in your books is not a problem! You are welcome to do so! And what if you bought your books last semester and couldn't stand to sell them back to the bookstore? They will also buy your used textbooks! You can also feel good about renting from them because they give back with each rental! They partner with Operation Smile to help provide cleft palate surgeries to children in developing countries. Every three minutes a child is born with a cleft lip, and in many countries their only hope for a normal life is through donation of funds for surgery. FTC disclosure: This is a paid post by Campus Book Rentals. I was allowed to choose what features of the website to discuss and I only promote companies where I believe in their products.